For this dish you don't really need quality meat any cut is fine. I used the rest of the flat iron steak i bought. The marinade is very similar to the bo luc lac. -1 teaspoon of soy sauce. -if you're using homemade fries then you'll need to deep fried the potato strips until it's golden and crispy. Remove from oil and set aside. If you are using the frozen fries then you can reheat them in the oven or flash fry them in hot oil. -Heat up 1/2 a tablespoon of oil in a pan or wok. 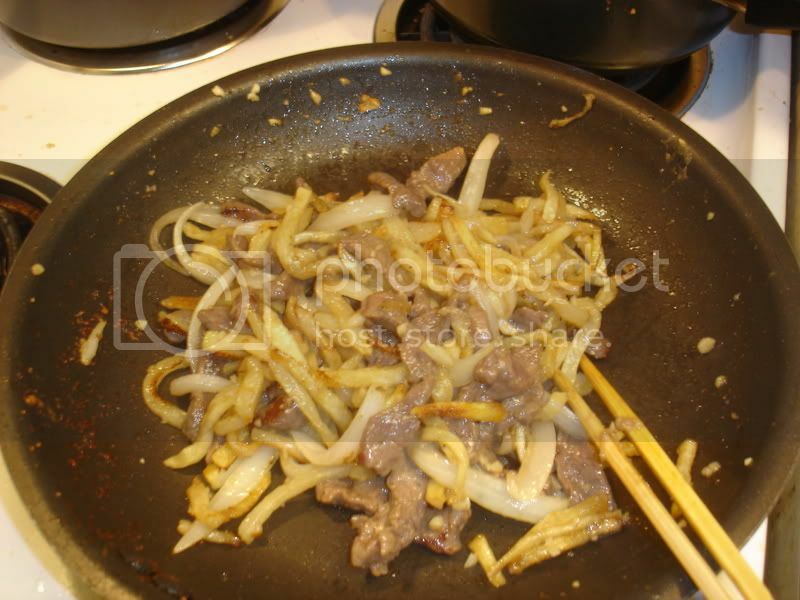 -add the beef strips and stir fry until the beef is no longer red. At this point you are done cooking and can serve with rice. The potatoes are kinda like hash brown at this point (shown in the pic above). I, however, like my hash brown extra crispy. So i keep the pan on high heat for a few extra minutes to continue to sear the fries and beef until they are crispy and even a little burned. This is how my mom makes it and I just love it this way! Thank you for this! My grandma used to make this for me (I am half Vietnamese) and I had no idea this was an actual dish until I googled it. I would be in heaven to eat this again, the way she used to make. Thank you so much for the recipe! This is so yummy! I omitted the salt since I felt like the soy sauce + fish sauce was salty enough. And added some onions and mushroom, and it was delicious! thank you!